In our previous post, The Disneyfication of Pocahontas and the True Story of Uleleh, we explored the origins of the Disney film Pocahontas and discovered that it has a deeper, more complex history than we thought. In today’s post, we delve into another Disney film, Frozen, which is said to be based on the fairy tale The Snow Queen by Hans Christian Andersen. Interestingly, there are speculations that Andersen’s fairy tales were actually inspired by Norse mythology, so we decided to examine The Snow Queen for these literary remnants. Join us as we peel back the layers of history to see how an ancient culture eventually gave rise to a 21st-century Oscar-winning animated film. Since 1943, Walt Disney Animation Studios had been struggling to bring a version of Hans Christian Andersen’s fairy tale The Snow Queen to the big screen. Walt Disney himself seized upon the idea while he was considering filming a biopic of Andersen, the celebrated Danish author who also penned The Little Mermaid and The Emperor’s New Clothes. The biopic didn’t pan out, and neither did a film adaptation of The Snow Queen. But the idea had taken root, and for the next several decades, the studio made repeated attempts to turn the fairy tale into a feature-length film. 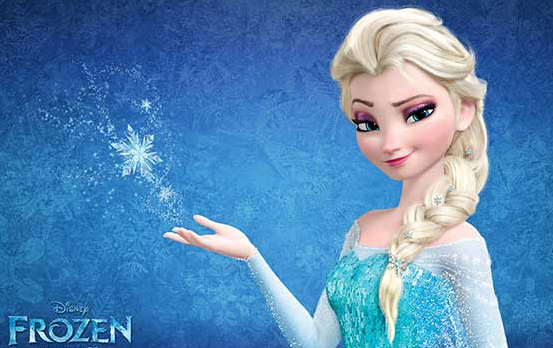 Finally, in 2013, Disney came out with Frozen, which is loosely based on The Snow Queen. Frozen, which won the Oscar for “Best Animated Feature Film,” is the story of two princesses, sisters, who become estranged when the older sister, Elsa, discovers that her powers of manipulating ice and snow could be dangerous. Elsa hides away from her younger sister Anna, afraid of hurting her, but one day her powers reveal themselves in an angry outburst. Elsa flees the castle, accidentally unleashing a permanent winter on the land she leaves behind. She takes refuge on a remote snowy mountain, building herself a palace of ice and glorying in her separation from the world. Her younger sister soon sets off in search of her. When Anna confronts Elsa in her palace, Elsa feels cornered and (albeit accidentally) strikes Anna an icy blow to the heart. Anna will die unless she can first commit an act of love. Like The Snow Queen, Frozen has a happy ending. But in almost every other respect, the film is a wild departure from the fairy tale. Yes, both stories feature a queen who can conjure ice and snow. A reindeer plays a supporting role in both. And an innocent, optimistic, brave young girl with a heart full of love saves the day in both stories. 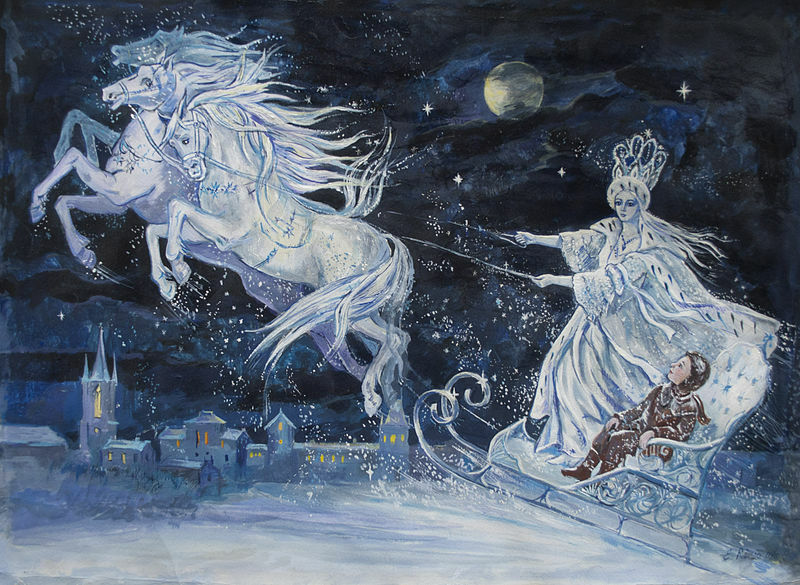 The Snow Queen, illustration by Elena Ringo. Still, Disney’s studio artists claimed that Andersen’s villainous Snow Queen did not lend herself to a film adaptation, therefore forcing a complete reworking of the plot. (In fact, this is not the first time Disney has made over a fairy tale by Hans Christian Andersen – The Little Mermaid underwent this treatment as well.) In The Snow Queen, the young heroine, Gerda, sets out to find her beloved friend, a young boy named Kai, who has been kidnapped by the Snow Queen. Gerda battles witchcraft, murderous robbers, hunger and extreme cold to reach Kai who is imprisoned inside the Snow Queen’s palace of ice. In the end, there is no climactic showdown between Gerda and the Snow Queen. (Which is perhaps another reason Disney felt the plot needed to be reinvented.) Actually, when Gerda arrives at the palace, the Snow Queen is nowhere to be found. She has flown south to Italy, where she plans to shower snow down upon Mount Vesuvius and Mount Etna. Kai and Gerda “strolled out of that enormous palace,” and at the story’s end (a few paragraphs later) they are safely back at home in Denmark. Disney dramatically altered the story of The Snow Queen to fit a modern context. This kind of process – inspiration and adaptation – happens in art all the time. So what about The Snow Queen itself? Did Hans Christian Andersen fashion the story purely from the fabric of his imagination? Or, like Disney, was he inspired by previously told stories, which he then adapted to appeal to the society in which he lived? Like much of 19th-century European literature, Andersen’s fairy tales often contain moral instruction aligned with the teachings of Christianity. In The Snow Queen, it’s Gerda’s Christian faith that supports her through her successful quest to rescue her friend. Yet woven through many of Andersen’s fairy tales are threads of Danish folklore and Norse mythology. Andersen, growing up in Denmark in the 19th century, would have been exposed to Danish folktales, which were in turn influenced by Norse mythology. His tales, despite having a proper Christian framework, are embroidered with magical beings and doings that are subtle renderings of Norse pagan rites and myths. Skadi hunting in the mountains. Illustration by H.L.M. in 1901. For example, some speculate that Andersen modeled the Snow Queen after the Norse goddess Skaði. 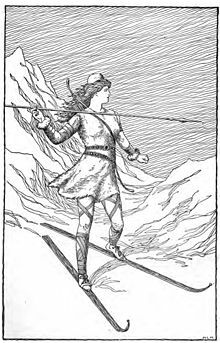 Skaði is associated with winter, mountains and skiing – in fact, she is often depicted as traveling about with skis strapped to her feet. Others believe that the Snow Queen was inspired by Hel, a Norse goddess who presided over the mythological realm of Niflheim, a land of ice and snow where men’s souls went after they died of sickness or old age. Also, according to SurLaLune, a website dedicated to annotating fairy tales, two central characters in The Snow Queen are plucked straight from Norse mythology. They are the two crows who assist Gerda at a critical point in her journey. According to myth, the god Odin carries two crows on his shoulders, referred to as Huginn and Muninn (Thought and Memory). The birds bring Odin information from all over his realm. In The Snow Queen, Gerda encounters the crows when she is searching for clues as to where Kai could be. The crows tell Gerda that they think Kai traveled to a palace, and married the princess within. The information turns out to be wrong, but nevertheless it is a step forward in Gerda’s journey to Kai. The crows take her to a benign prince and princess who provide her with much-needed supplies, and Gerda sets off again. 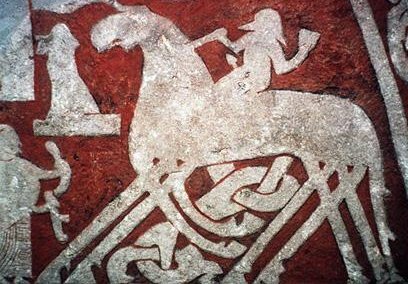 The Norse god Odin on his horse Sleipnir, featured on the Tjängvide image stone in Vallhalla. Andersen also gives a nod to the ancient European myth of the “wild hunt,” in which ghostly hunters ride across the night skies. In Norse tradition, Odin leads the hunt on his eight-legged horse Sleipnir. In The Snow Queen, when Gerda is taken to the palace to see the prince and princess who will help her on her way, she sees shadowy figures on horseback galloping along the walls. The crows tell her the shadows are just dream-figures, riding off to the hunt. Andersen’s use of “stock characters” in The Snow Queen – stereotypical figures whom audiences will recognize as having certain traits or functions within a story – is further evidence that the tale was influenced by folklore. A crone – an old woman with witch-like abilities – tries to bewitch Gerda into remaining at her cottage forever. According to Francesca Matteoni, a researcher in early modern history at the University of Hertfordhire, this “very old” woman who walked with a crutch exemplifies a typical folkloric character. 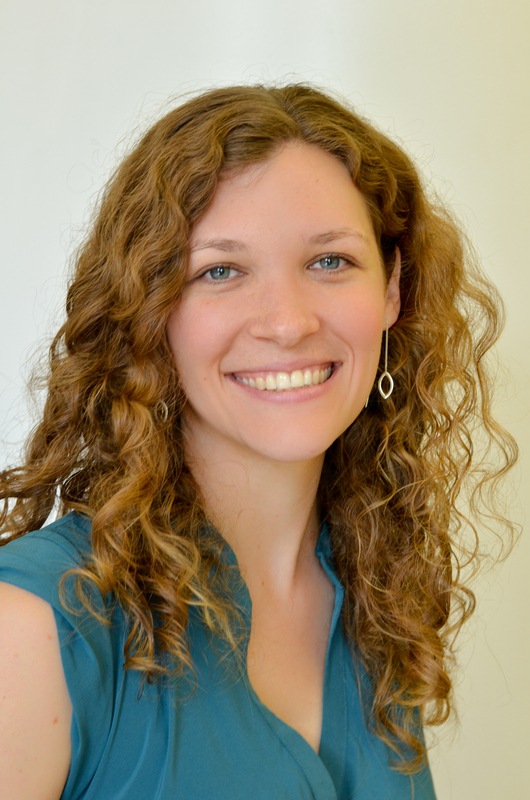 In myths and fairy tales, age and disability are common indicators of supernaturality. Also, the crone’s cottage, inside which time stands still, is a microcosm of the realm of death, over which many mythological characters – and the Snow Queen herself – preside. Other subtle elements of Norse mythology and Danish folklore appear throughout The Snow Queen, giving the tale a complexity and richness that has beckoned audiences (and artists) for over a century. Frozen is the latest retelling of these stories that were begun thousands of years ago. Which leads us to the intriguing prospect: could Frozen itself serve as inspiration for future generations of storytellers? Thanks to Disney, another fable buried in mythology’s vault has been resurrected and reconstituted. Where will tomorrow’s imaginations lead next? This entry was posted in Blog, Celebrities, Culture, Literature, Public Life, Recreation and tagged ancient history, Anna, AntiquityNOW, Disney, Elsa, Frozen, Hans Christian Anderson, Norse mythology, Odin, Skaði, The Snow Queen. Bookmark the permalink. Pingback: Episode 15: Happy Feministmas!! | She Who Persisted.